Item # 314508 Stash Points: 395 (?) This is the number of points you get in The Zumiez Stash for purchasing this item. Stash points are redeemable for exclusive rewards only available to Zumiez Stash members. To redeem your points check out the rewards catalog on thestash.zumiez.com. Give some humor and hip hop style to whatever your stickering out with the Biggie Baby Cartoon Sticker. This circular and bright yellow sticker comes with the young, cartoon image of Biggie Smalls clutching a wad of cash while wearing sunglasses for a fun look. 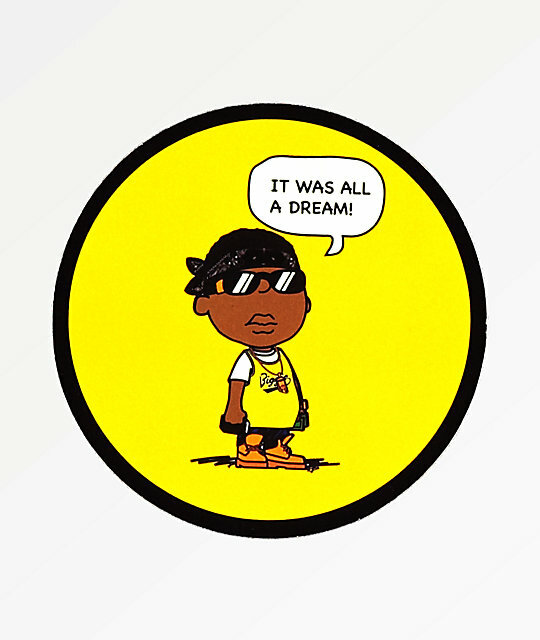 Baby biggie cartoon graphic with "It was all a dream" text. 3.5" &vert; 9cm approx. diameter.